This case developed in the location of Kumburgaz between the years 2007, 2008, and 2009. 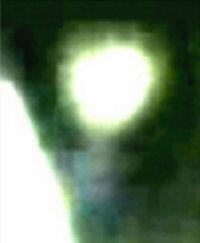 Its main witness was a night guard named Yalcin Yalman, who while on duty registered video of strange objects that appeared at sunrise like floating or changing while in flight over the sea on the coast of Marmara. Yalman was able to film many video segments, some during the day accompanied by witnesses with whom he spoke to while he was filming. between 2007 and 2009 and witnessed by local residents). One singularity of this case was that the images were made with a camera that had an adapter for close ups of 200X optical, achieving a great amount of detail of the objects. 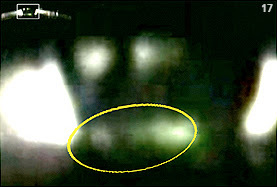 At first, the videos were analyzed and made public by the SIRIUS UFO organization, directed by the researcher Haktan Akdogan. This case made big news in Turkey and in other countries as well. It also started a great debate between the official members of the Turkish scientific community. Specifically the NATIONAL COUNCIL FOR THE STUDY OF SCIENCE AND TECHNOLOGY (TUBITAK) got interested in analyzing the original footage, with the intention of determining that the video was nothing more than a hoax, gambling on the idea of scale models, toys, or CGI. "The objects observed on the images have a structure made of a specific material and are definitely not any kind of CGI animation or in any means a type of special effects used for simulation in a studio or for video effects. So the conclusion of this report is that the observations are not a model, marquette, or a fraud" and the last part of the report, "it's concluded that the objects observed have a physical structure and are made of materials that don't belong to any category of (airplanes, helicopters, meteors, Venus, Mars, satellites, artificial lights, Chinese lanterns, etc.) and that it mostly fits in the category of UFO's (Unidentified Flying Objects and of unknown origin)". Other analysis was done by video specialist, image edition and special effect companies from Japan, Russia, and Turkey, all ending up with the same conclusions. In Chile, I asked professor José Atenas to technically examine the videos, an expert in graphics and video with more than 30 years of experience on television. In his appreciation, José Atenas also came to the same conclusions that the images are authentic. So far nobody has been able to demonstrate that the recordings are product of tricks or some type of manipulation. Therefore, the debate has concentrated more over the nature and origin of the objects filmed by Yalcin Yalman. 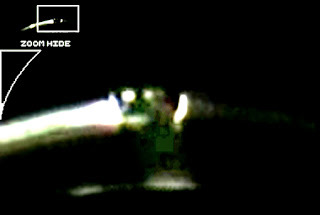 To be honest, at the beginning my idea was to analyze the videos hoping to find some elements in them that would be evidence of a possible fraud, taking in count the spectacular manner in which the case was labeled (announced that for the very first time a UFO was videotaped with its occupants precisely inside one of the objects) not a minor issue for those of us who are obsessed with these themes. It was from skepticism, and why not say it, with a quote of prejudgment I decided to take some time and checkout the fragments of the movie. You could say that my expectations were to "find the string of the puppet". To make the analysis, I used electronic copies of the original videos, given to me by the Turkish investigator Haktan Akdogan, who picked up this case first handed. I met with Haktan personally to comment about this incident and I was very grateful of him handing me a copy of the original tape, with which I could accomplish this work. The analysis will be exposed in a chronological and sequential way, in the same order that the research and results came. Finally, what I present here is only a portion of all that was extracted from the videos and from the image analysis. It is a lot of material and when the moment comes I will complete this publication with more findings. There is always a first impression, and it even can be subjective, and by the way, preliminary. At first look, it called my attention to the honesty of the takes. That is, you can't observe any kind of tendency or intention of hiding something. It is clear that the film man does everything possible to configure his camera the best way to capture the objects; he makes constant changes in light entry and zoom, trying to show as clearly possible what is happening while he films. He also worries on registering different reference points and at the same time making very powerful close-ups. Even at first if the appreciation can be subjective, as I mentioned before, it must be considered in the context of an attitude and disposition totally open of the witness, who has shown his face and delivered all the background of this case, including the video camera and the original tapes. After my first look, at the (IMAGE: film grain, illumination, close ups, and reference points also AUDIO: ambient sound, narration, and witness attitude) agrees totally with an authentic recording of objects at a great distance, filmed at night time (the ones used in this work). There are also daytime recordings with interesting details, but in this analysis will be only the night ones. Having these observations in account, plus the reports from TUBITAK and the opinion of professor José Atenas, I am willing to do and expose the following graphic analysis. 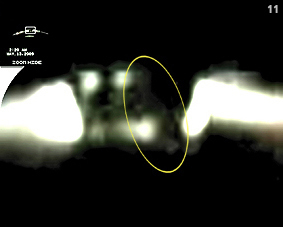 Given that the most spectacular aspects of the case rest on the alleged presence of UFO occupants in the footage, the observation point was centered primarily in the center zone of the object, that's where, according to the witness; there was "someone", what has been interpreted as the occupants or crew. In summary, the records of the case indicate that in the center of the object would be found some type of door or window that at times remains opened and from where it's possible to see two "heads", which would correspond to the slippery occupants. A short time after reviewing, I could observe a couple of photograms that caused me strangeness and amazement. My first reaction was to say “Bingo! Here there's something”. After a second view of the fragment, I was able to isolate a sequence that seems, to say the less, interesting. Not just because of the clarity of the takes, but also because the investigation started to turn more complex from the point of view of the different explanation theories possible. In fact, at this point a series of questions appear, that later I will comment on. One of the photograms of the sequence. This is the original image, just as it appears on the recording﻿. In this image only one level filter was applied, increasing the luminosity of the scene. This allows the extraction of the most data possible that the camera could capture, without modifying the image quality. After checking uncountable times this photogram sequence (5), I got the conviction that the figure in question is not static; by the contrary, it is in permanent movement, in general with the “view” looking down, with the exception of this segment, in which the figure happens from this position to look fixedly at the front, to then lower the “view” again. summarized in the 4 principal ones. the image start to lower in relation to the settings. (ahead I will explain the importance of this detail). 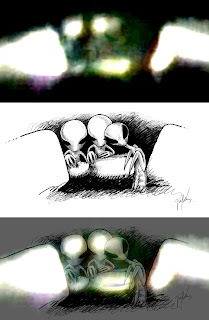 In the second frame, the figure has its head straight, in “look front” position. In the third photogram the figure keeps its position. Finally, in the fourth frame, the figure returns to its original position. This sequence is produced while the image, that is to say, the object, begins to lower in relation to the setting, which in my opinion owes to an ascending movement of the camera. This movement in general produces a distortion of sweep in the image, an artifact of out of focus movement. Well then, simultaneously, while this happens, the figure realizes the action to raise the head, being opposed to the decrease of the image and annulling the sweep of distortion. That is to say, a synchrony of the image takes place in the zone where both opposite movements are, producing clarity and sharpness in the zone. When the figure returns to lower the head, it does it in the same descending sense of the image, returning to generate the out of focus of movement. 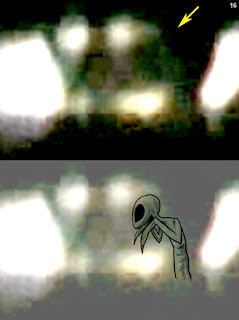 In the following close up sequence, (6) it's possible to see that the "humanoid" figure is visible even without the need to apply zoom. Though it is true that the previous images are clearer samples I could have obtained of the central figure, there are great the sequences and stills of interest that I have selected. Nevertheless, for motives of space and time for explaining them, I have chosen the following three stills (7, 8, and 9) that support the hypothesis of which the figure in analysis is really in the recording and is not product of games of lights and shades or a bad interpretation of any another element. In my opinion, the figure humanoid is in the filming and is in constant movement. In this point of the analysis it seems important to me to clear the questions about if there are two figures with these characteristics that appear in the videos. For this, I focused the analysis in the left zone. 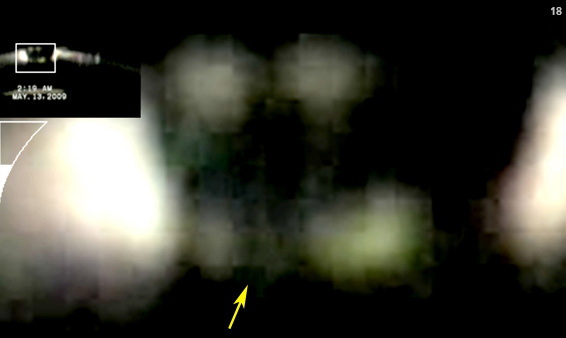 The idea is to find out if it's possible to find in that zone an image similar to the previously exposed. Effectively, in the following I expose at least one still (10) that can support this idea. As I indicated previously while analyzing the first sequence of stills the following detail raised my attention. Something moves in the first plane, almost in front of the figure in study. To try to solve this questioning, I returned to check the complete video, at different speeds and levels of close ups, centering the observation only on this zone. (11) You can check the sequence of video and identify the zone to which I refer. Well then after checking the videos at different configurations of reproduction, I have come to a strange enough and complex conclusion of explaining without showing simultaneously the fragments of video, which is difficult to do for this way. Nevertheless, I will try to do it by means of isolated stills and explanatory drawings. What moves in front of the figures that we saw previously seems to be a third figure. This one has characteristics different from the previous ones. In concrete, it's a figure with an "insectoid" aspect in his form and movements. If it had to describe it or to classify it somehow, I would say that it's looks very close to a praying mantis. It has a brown color, his head is not so big as that of the previous ones and is of triangular form. It has two very big and dark eyes, located to the sides of the head and in ascending form. It seems to have a long neck and a very thin body. On having checked carefully the videos, it is possible to distinguish his arms stretching in a similar way that the mantis does. His position in the scene is of profile orientated towards the left side of the image, his body remains sloping or curved, moving permanently the head and the arms, and simultaneously inclines forward. (While analyzing the movement of this one and the other figures, I repaired in a singular enough detail in relation to the way in which they move. Hereinafter I will comment on this point). Now I will expose a series of stills that show the figure that I have just described (12, 13, 14, 15, and 16). Again I repeat that the best way of checking this finding is looking at the videos, in different configurations of reproduction. Nevertheless, I believe that the following stills can serve to support this hypothesis. interpretation is in drawing, stocks in the study of the videos and the isolated frames. The drawings (of my authorship) interpret what appears in the videos. They are a mixture between the information gathered from the analysis of the form and movement of the figure and the stills. 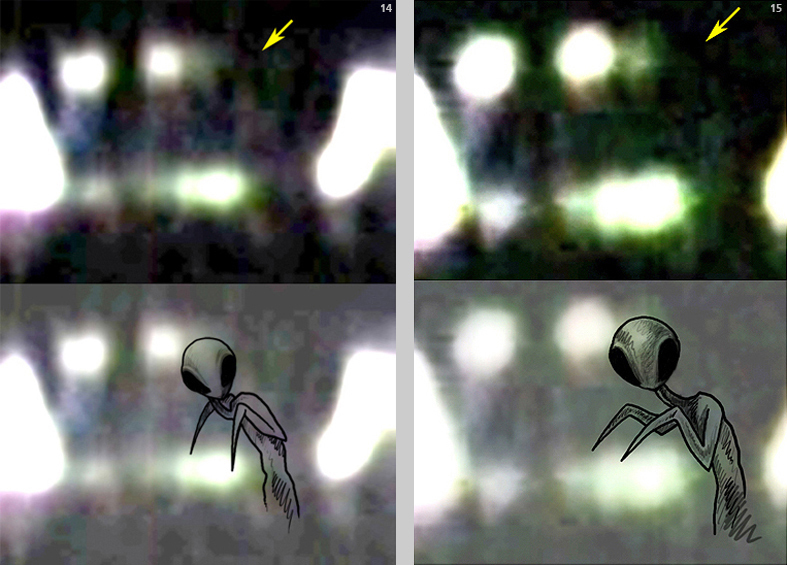 Though the thinnest details do not appear clearly in these captures, they have been gathered from the information obtained after analyzing the totality of the videos. In some segments and stills, some details appear with major clarity and in other fragments there are different the elements that are rescued. On having assembled all the details, it is possible to come to the conclusion that the drawings show. For example, in these stills the drawings are based more than anything on the location of the head, the eyes and the torso, and I have overlaid them over the frozen frames. The detail of the arms, on the other hand, has obtained of the observation of the videos in movement, which turns out to be very complex of exhibiting this way. In the above still it's possible to estimate a thinner figure, of brown color and of smaller head, which is in front of the other two figures. Seemingly it's standing up. Also the figure of the center turns out to be visible "looking" at the left side and slightly down. As the slogan the title of this work, this one is a graphical analysis. That is to say, it is based strictly on the images and tries to give clarity respect of the information that the camera achieved to catch in the videos. In this respect, I try to be rigorous not do any affirmations respect of the nature and the origin of what appears in the filming. Except, obviously, that in the course of the investigation I find elements that could solve the case with some conventional explanation, thing that up to the moment has not happened. Also I have not found reports or investigations of organisms not of particular investigators who give a conventional and convincing explanation in the matter. In the final conclusions I will explain why I underline this of the graphical analysis and my caution in doing affirmations on the origin of what appears in the videos. In relation to the observed until now, we can summarize that in conformity with the statement of the witness, there is more than one figure of humanoids characteristics moving in the central part of the object, in concrete there are three. Two of similar characteristics (head enlarged in relation to what it's possible to estimate of the body, something similar to big dark eyes and a seemingly thin body) and a third party of different appearance, which I have graphed as of "insectoid" characteristics for his form and movements, very similar to a praying mantis. The three figures are in constant movement and seemingly interacting between them. The figure of singular characteristics seems to be in front in relation to the camera and in profile position orientated towards the left side of the image. Already I mentioned lines behind that while analyzing the movement of the figures I repaired in a singular detail: the figures move in an extremely fast way, as if the video was being reproduced to the highest speed. Only on having been lowering the speed of reproduction it is possible to begin to identify the figures and his movements. In fact, the sequence in which the central figure raises his head and turns it going down happens in only an eighth part of a second. It turns out difficult to determine to what speed of reproduction the movements approach a level of "normality", but it is clear that to come more or less to this point it is necessary to reproduce the videos to a speed of extremely slow motion. I leave this precedent in the table for consideration, since I imagine that the theories and hypothesis on this point are not going to be absent. After finding these images, it turns out to be inevitable to ask. What are these figures? And, specifically, what are they doing? Why do they move so much? Well then, from now the analysis will go on trying to clear some of these questions. The three figures seem to be manipulating something in the mentioned zone. Permanently we can appreciate movements that can be assumed to be the hands moving in this space. At this point I expose some stills that can support this idea. Nevertheless, after studying this zone of the scene I could find a worrying enough image (18), which might begin to give indications of what they might be doing these three enigmatic figures. In the analysis I could observe that what appears in this zone of the image is not more not less than another figure, located in a horizontal way and of which I could rescue a still where it appreciates the head with relative clarity, and even it is possible to estimate the face (18). Down below, the processing of the image, applying only a close up (19) and a slight increase in the levels of lighting (20), procedures that do not alter mainly the information contained in the image. Still with the original image, without any type of intervention. Close up of the image and embossment of the level of light. In this graph, as in the previous exercises, I superimpose my interpretation in drawing on the isolated still. The hypothesis is that a fourth figure is in the scene. This one remains in horizontal position, while seemingly it is manipulated by the other three. I consider being necessary to repeat that this interpretation in drawing of the captured still is based, besides the frame, on the observation of the whole video and the analysis of the movements that in this one appear. That is to say, on having analyzed the totality of the video I have raised the hypothesis before indicated and later I have looked for the segments or stills that demonstrate of the best way this idea. Though it's true that some of the details to which I refer in this analysis are too thin, since to be visible in a filming of these characteristics - it is to say, objects filmed at great distance, I think that the adaptor of 200X used by Yalman has done its work. Some details are clearer than others, but the review of the total of the videos plus the isolated information gives a consistent enough general panorama. Certainly, all this is left for the consideration of every spectator. My conviction is the one that I expose in this work. Later, a segment of compound video of 2 consecutive frames that shows the movements in the zone where the hands are located of the central figures. 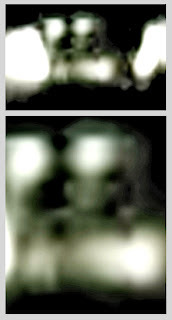 Though with low video quality, it is possible to see that the heads of both figures in the center remain immobile, while the movement is observed in the zone where the hands are found, that is to say, on the figure that remains leaned. Other details that can be seen in this segment are the movements of the "insectoid" aspect figure, located to the right of the image - specifically the head (of brown color), besides the shades of the eyes in the figure that is in horizontal position. With all this information, some with details and others of more general aspect, it is that I arranged to graphicate by means of a lifted hand drawing, my interpretation of what happens in these images from the video. In summary: two figures of similar characteristics (big heads in relation to the body, of big dark eyes), accompanied of a third figure, thin and of brown color, of "insectoid" aspect (similar to a praying mantis), of big seemingly black eyes, they manipulate or realize some action on a fourth figure of characteristics seemingly different from other three, which it remains leaned or in horizontal position. All this in, over or to the interior of an allegedly flying object, which up to the moment is kept classified like not identified. (On this point, at the end of this report I will do a small analysis in relation to the objects). The drawing is based on the totality of the elements obtained in the analysis, but for it's comprehension it will be mounted on one of the exposed stills. I do this explanation due to the fact that all the details that the drawing do not appear in the chosen still. Nevertheless, they are visible in the development of the whole investigation and have been agglutinated and mounted over this individual still. In the following I expose only some scopes in relation to the images where the objects appear, allegedly flying and up to the moment not identified. 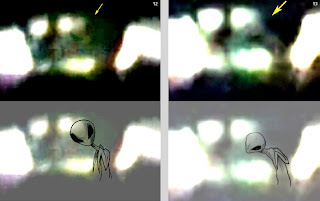 One of the controversial details of the case is that, according to the statement of the witness, in the top part of the UFOs a species of windows or hatches would open, where the occupants would let them be seen. 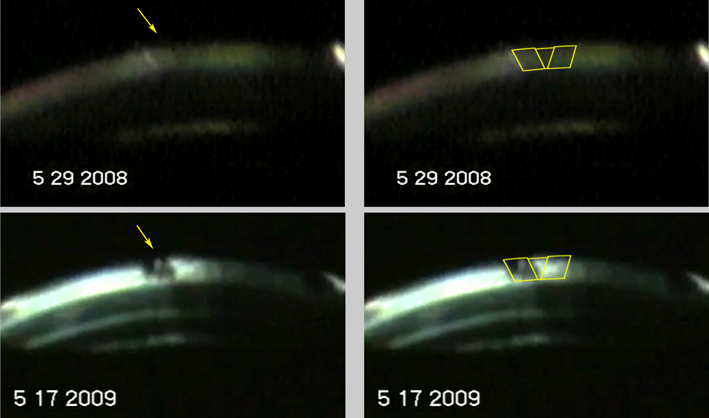 Well then, here I realize an exercise of comparison between two frames obtained of two different videos, recorded in different dates, May 29, 2008 and May 17, 2009. In the first comparison, the object recorded the year 2008 would remain with the "hatches closed", being visible the reliefs and cuts in the place where they would be located. 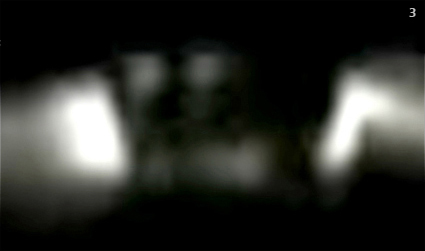 On the other hand, in the video corresponding to the year 2009 the openings would be opened, being visible what the witness interprets as "someone". In the second comparison, I realize an exercise of alignment between both videos in order to establish the coincidence between what it would be the clear opening, in the video of the year 2009, and closed in the recording of the year 2008. The alignment turns out to be correct, as also the other possible openings located to the side. Another interesting aspect are the diurnal videos. In these segments only the light sources are visible, due to the fact that since they are obtained by day or at the beginning of the dawn, the conditions change notably. In these circumstances there exist several elements that they interpose between the camera and the object as to obtain images similar to the night ones. In this case, they interfere the daylight, the haze of present dawn in the coastal place, plus the distance. This provokes that the details are prevented visually and only lets us see the lights rather distorted by the perspective. Some investigators have affirmed that the objects caught in the diurnal videos correspond to the lights of a craft filmed to great distance. This one is an interesting detail, since on having done this affirmation they are delivering an estimation of the size that these objects might have. Nevertheless, some of them affirm that the UFOs caught by night would not be the same that appear in the diurnal videos. 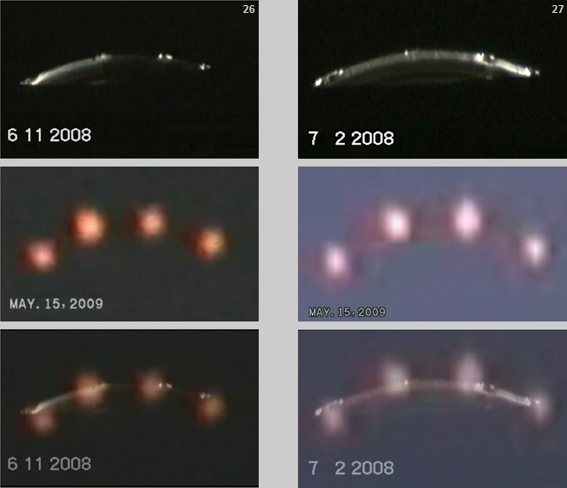 Here I present a comparison with exercising an alignment between the recorded videos on November 6, 2008 and May 15, 2009, and another one between the videos of June 2, 2008 and May 15, 2009. 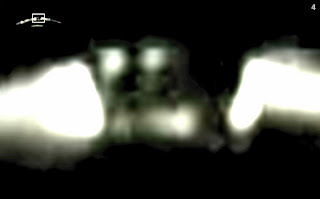 One of the images of May 15, 2009 is seen over a dark background due to the fact that it was recorded with the first daylight, at 5:20 a.m., and the capture has loss of light due to the applied zoom, but nevertheless it is a diurnal video. Here also the alignment turns out to be correct. During this investigation it has not been possible to find indications of manipulation, assemblies, or tricks used for the production of the videos. The objects caught in the tape do not correspond to static figures. 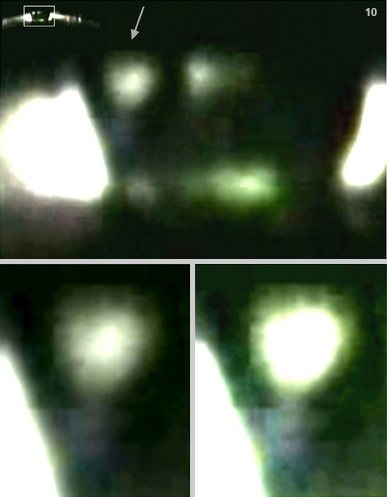 After doing close ups to the images, it is possible to observe that in the zone where, according to the statement of the witness, it is possible to see the occupants of the objects, and it's observed constant movement, produced by three figures with the characteristics before indicated and gesticulating in the way previously described. When reproducing the video at normal speed, it's difficult to recognize what's exposed in this analysis, since the figures move at an extremely rapid speed, as if the video was being reproduced at an intensive speed. Only lowering in a considerable way the speed of reproduction it is possible to identify the figures and determine its movements. Even a frame by frame observation is necessary. In my opinion, it's about live recorded images. They are not generated by computer animation and not 3D renderings. Neither do they seem to be filming puppets or scale models. This possibility is improbable, between other reasons, for the movement and gesticulating that is observed in the figures found in this analysis and because according to my vision in relation to the size and the proportions of the objects, rather they might be like the size that you would have in a light aircraft or a yacht with his crew members, filmed distantly and increased with a powerful enough zoom. 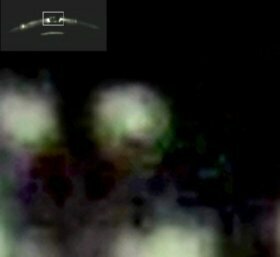 None of the images or theories here exposed have been found nor published previously, with one to three years passed since the events. Obviously, they have not been exploited somehow, neither by the witnesses of the case, nor by the investigators who analyzed or announced it, nor by speculators of the UFOs topics. It is improbable that someone has plotted a fraud with these characteristics without the most controversial and polemic images having gone out into the public light. To make a few images or scenes as those that appear in these videos, one would need, to my understanding, a great quantity of time resources and know-how in the area of the special effects, which does not mean that it should be impossible. What really turns out to be a strange enclosed absurdity is that even if this has happened, the realized work has been mastered finally (and only the zone of the object, not this way neither the rest of the image nor the audio) with a speed of reproduction so rapid that it makes almost impossible to notice his presence in the tape. Consequently, nobody would see it, since it has not been discovered until now. I consider these details of great importance, since they impede furthermore the conventional explanation. As I heeled in the course of this investigation, that it is an analysis that refers to the graphical aspect and not neither to the nature nor the origin of what one has been found in the videos, since I would not have how to demonstrate any affirmation in this sense. 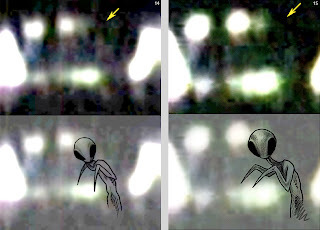 As well as they have not found elements to affirm that the figures and forms that appear in the images should be computer animations or scale models, also the non existence of concrete evidence that the figures that here appear have some origin or certain nature that could be demonstrated. My conclusion is that this case is, up to the moment, a real event of high strangeness, with the characteristics here exposed, that does not have a conventional, convincing and demonstrable explanation and that therefore, to my understanding, is kept unidentified.